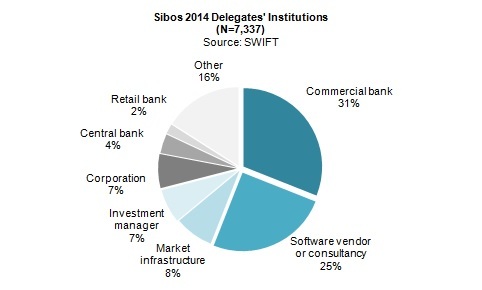 At Sibos 2014, new entrants and technologies are both threats and opportunities for payments and securities markets. Boston, October 30, 2014 – Returning to the shores of the United States this year and to the city of Boston, Sibos 2014 focused on SWIFT's achievements over the last seven years, ongoing regulatory overload for the industry, and the growing trend toward digitization. Keeping ahead of nonbank competition and the need to digitize interactions with clients was at the top of the agenda, and the conference included forums focused on industry topics related to corporations, market infrastructures, standards, and compliance as well as the technology innovation-focused Innotribe sessions. This Aite Group Impact Note rounds up the key discussion topics from the event and evaluates how some of these reflect SWIFT's five-year strategic program, which is entering its last year in 2015. This 44-page Impact Note contains 16 figures and one table. Clients of Aite Group's Institutional Securities & Investments, Wholesale Banking & Payments, or Retail Banking & Payments service can download this report.